HUL’s Dove keeps reinventing its Youtube page to keep subscribers interested and introduce new content to the platform, in addition to all the existing Facebook action of course. The latest campaign is around Dove’s new Hair fall Rescue Treatment product which is being pitched as the new Dove secret formulation that strengthens hair from the roots in 2 weeks, thereby reducing breakage. 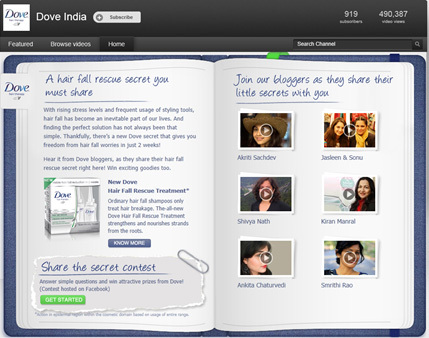 The Youtube landing page for Dove brings together all the elements around the campaign within an embedded app that is presented in a Dove Hair Therapy Secret Diary design. Dove created a Blogger activation program for the campaign and Youtube hosts professionally-recorded videos from 6 shortlisted bloggers who talk us through their stories of how they benefitted from the new Dove formulation. Other elements on the page take users to the Facebook application. 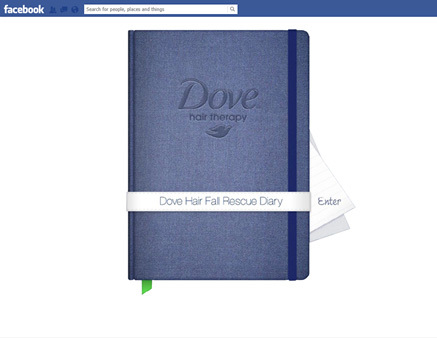 The Secret Diary application on Facebook is a deep app that brings together branded content, including details and bytes on hair fall, the new range and content generated from bloggers. Share The Secret Trivia Contest on Facebook ensures that fans read through the blogger stories and come back to answer questions. Winners get to walk away with Dove Beauty Kits and bags. Just like Samsung, HUL’s Dove stays true to its brand imagery and guidelines. The design elements remain the same across platforms. The creatives are top notch, the promo is seamless and well thought out. Again, a great end-to-end, flawless campaign from Dove.